Love your projects. Love the bright colors. great colors. I love the ribbon. I love the bright colors. It screams Happy Birthday! 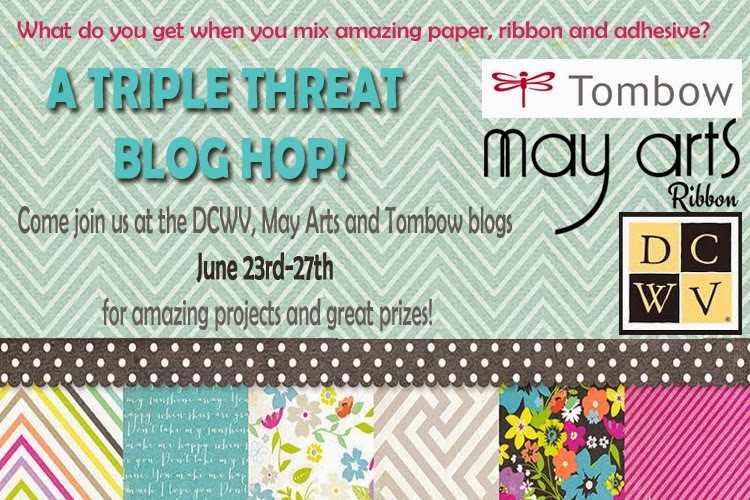 Love the May Arts burlap ribbon, too. Fun card! BRIGHT & CHEERY card & gift bag Charlene!!! I love your sweet cards! What a neat idea to tie the pixie sticks on with the fun ribbon! What a fun card and gift bag! I love that you used your own handwriting! That makes it even more special in my opinion! TFS! Ok, am so inspired today with your fun gift bag and card! Love the pixie sticks with all the jazzy ribbons! So happy and bright! The cards and decorations are so colorful. they will really add to the party. What fun, happy projects! I love the pixie sticks with the ribbon as well! Super cute! What an adorable card and bag set! Love the fun,bright and cheery colors! What super cute cards. Love the candy tied to the one. This birthday package is so original and fun ! Love the bright colors ! I love the colors on your bag. They are so bright and cheerful and the ribbons too. Thanks for sharing. Love your gift bag and card the colors are great for a boy!!! Genius using the wired ribbon on the pixie sticks. I would never think to do that. I so,appreciate all the talent and inspiration from design teams. Great idea on the bag, love the ribbon, stars and plaid. Those bright colors are so awesome! What fun projects! So colorful and fun! Great project, love the coordinated card and package! What a fun way to package a gift! What fun projects! Thanks for sharing your ideas! I love your gift bag and birhtday card, wonderful colors and the Pixe Stix are the perfect touch. That is so cute! It's great to see boy inspired ideas! Great job, love the bright colors. TFS. Lovely cards and I just love the treat bad. Beautiful colors. I really like this birthday set. Love the party inspiration card. Great use for the white board stack. Cute project! This makes me want to throw a party! Love these fantastic ideas, and your great papers. this is just so cute. perfect birthday party colors and i love those ribbons! Love this fun chevron ribbon! This is new to me. :) Love how you included the pixie sticks. Thanks for sharing. Such fun cards....a gift themselves! Thanks for some great inspiration! Cute card and gift bag, love the bright colors! Very fun, bright, carefree project. The colorful DCWV papers and those pixie sticks are genius! Really cute card and gift bag, it's amazing how you did to the ribbon, love it! Bright and festive ribbon is so pretty! I love this! I haven't seen the White Board stack, but I love it! I love the bright colors; great job! This is absolutely darling and fun! I love it!